This was something I had seen recently on Giada's Everyday Italian on the Food Network. I just love her recipes for their simplicity. A number of her recipes are really quick to make, healthy and very satisfying. I have been waiting to try this particular recipe since I saw that episode and I went to the store just to buy some ravioli yesterday. Take water in a large vessel, salt it and bring it to a rolling boil. Meanwhile, in a small pan, melt the butter over medium heat, stirring & continue heating till the butter turns a nice golden brown color. Set this aside. Cool for a minute or two and add the balsamic vinegar, honey, some salt & pepper. Mix well. Toast some chopped walnuts in the oven. Toasting enhances the flavor of the nuts & gives a nice crunch to the dish. When the ravioli are done, drain off the water and transfer onto a serving dish. Add the balsamic brown butter to this and mix well. 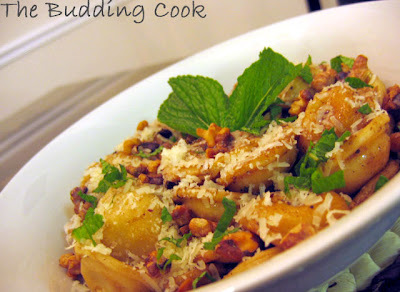 Sprinkle the toasted walnuts and grated Parmesan cheese on the top. I could not believe that something so simple could taste so good! I loved how the balsamic brown butter tasted. I was getting a little tired of seeing/eating pastas with the same old tomato based sauces. This was a nice change & I am going to make it often. Place all the ingredients in a blender & blend till smooth. Garnish with some fresh mint & serve chilled. Cantaloupe smoothie is yum.I like the photo,very bright sunny spot. i guess ghee can be used in lieu of brown butter. i've tasted something similar as a topping on strawberries. loved it. Yummy. I used to make ravioli by hand from scratch. Even now, the readymade ones we get here are sooooooooooooooooooooo expensive that I will probably make them at home again. Looks great - actually both the dishes look fab. i love dishes that use minimum ingredients, are simple and yet so delicious. i shd be trying that ravioli soon. You always present something different TBC. Cantaloupe smoothie is very inviting. I have seen this fruit in stores, but never tried to use it. Time has come now. Thanks for the lovely post. Nice recipes and pics:) I love watching food network but never really try the recipes- great to know this one tastes good! wow! that looks amazing!...simple and quick meal.. I too love Giada's show, some how I don't like her travel series. That ravioli and smoothies are tempting. I love ravioli...your's look delicious. The ravioli looks so delish. I love pasta dishes and I love balsamic vinegar, not to mention the walnuts. This my kind of dish. Thanks, Jeena. I will definitely stop by. Yes, Richa, this was really good & I will make it again. Bee, now why didn't I think of that? !.I'm going to top some berries with it like you said the next time. Archana, thank you:-)You are right , I guess I could still do it. It took only 20 min or so. Anyway, I have already sent one entry for now. Ravioli from scratch?? Wow!I wouldn't even know how to go about doing it. Do u need some kind of special equipment/gadget for it? Thanks ! It is only now that I have started experimenting a bit. I usually never try out anything I see on FN but this one really looked good & simple. Awwwww Nags, u say the nicest things! Hi! I'm glad your blog hopping landed on my blog so I could find you too! What great recipes you have! 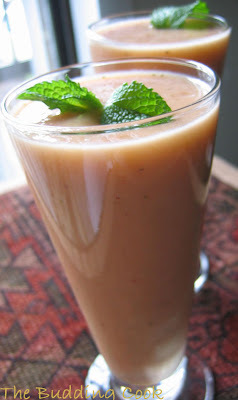 My husband will love this cantaloupe smoothie, he's the king of smoothies around here. Chris, thanks for stopping by! The cantaloupe smoothie sounds great. Kevin, thanks for stopping by. Do let me know how the smoothie turns out for you when you make it. I love this recipe too! We make this at home at least a few times a month. Love your site! Hope you stop by again!